As we move toward autonomous cars, let's see how researchers are looking at steering and how gestures can help humans maintain control. Autonomous driving is undoubtedly going to disrupt a great many industries, but to date, most of the discussion has revolved around its impact on vehicle manufacturers and insurers. It’s inevitable that it will also impact suppliers, however, so it’s interesting to see the German company ZF innovating to prepare for the driverless future. The company has already explored how airbags might evolve in driverless cars, and it has now turned its attention to the steering wheel itself. Of course, you may ponder whether there will even be steering wheels in a driverless car, but before we get to that stage, there is likely to be a time where humans will need to regain control of the vehicle. The ZF steering wheel has been developed to allow the driver to regain control of the vehicle using gestures. The exact details of how gesture control will be implemented are largely left to the automakers themselves, but the company suggests things like a tapping motion that could be used to honk the horn or a swiping function to activate climate control. At the heart of the device is a 7-inch LCD screen with a light strip indicating whether the car is in driverless or manual mode. For instance, when the strip turns red, it signifies impending danger. Central to the device is the ability to smoothly transition from autonomous to manual. I wrote recently about a Stanford study that analyzed the ease with which drivers can regain control, and the results suggest it is far from straightforward. The study placed a number of test drivers on a track to find out, and the results suggest the transition isn’t as smooth as we might think. This was also the topic of a second study, this time from the University of Southampton, which examined just how long it might take for control to go back and forth between man and machine. The study saw a number of participants in a driving simulator, where they were driving at 70mph. Sometimes they were otherwise engaged in separate tasks, other times they were not. The researchers wanted to test the response time when they both ceded control, and regained it from an automated system, with intervention requests sent at random intervals during their drive. Perhaps not surprisingly, whenever the participants were engaged in something other than focusing on the road, their response time was much longer. Even then though, the response time was anything but uniform, with some responding in just 1.9 seconds, but others taking up to 25.7 seconds. This represents a huge challenge for designers when building devices that cater for such a wide range. 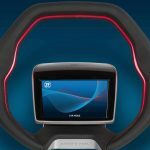 The ZF steering wheel attempts to help by featuring 10 capacitive sensors to accurately measure when the steering wheel is being gripped or not. This is interesting because even the ‘autopilot’ style technologies currently deployed in vehicles today require the driver to keep their hands on the steering wheel. Suffice to say, however, this is very much a concept device at the moment and as such it’s unclear whether it will ever make it into production, but its an interesting development nonetheless. Will Driverless Cars Increase Traffic Congestion? What Do People Think of Driverless Cars?